There are very few cars that have stood the test of time and arguably become even more popular over the years, but the G-Wagen is certainly one of them. A design virtually unchanged since its introduction in 1979, the G-Wagen over its 38 year production run up until just this year, has become something of a cult car. Originally designed as a simple off-roader, they can be more commonly found roaming the London Borough of Kensington and Chelsea. It is perhaps though the earlier, more simple versions though that will last the longest! This car was first registered on the 24th of September 1985 and is one of the first series W460 Models, supplied new to Springfield Firearms Ltd of Truro, Cornwall. It was transferred to its director until he passed away in 2016. The car came with the pick of the engines, the 2.8 litre DOHC straight six which was used by many of Mercedes’ models at the time. With more power and torque than the others, including the diesels, it made the car much more usable on and off the road. This car is finished in the Cypress Green, with the interior in Grey Sports Cloth. The paintwork is in good condition all over with marks conducive with a used, but cherished life. The interior is in great condition, with just some wear to the driver’s seat bolster. The rest is virtually unmarked, with all interior trim in great shape and the rear seats in superb condition. The car comes with tinted glass all round and wind-up windows, it even still has its original Blaupunkt stereo. The engine bay is very original and honest, perhaps that is what has kept in such great shape. On the road the car drives very much as you’d expect! Seriously though, the engine is great, pulling very strongly, the gearshift is easy and both the diff-locks work perfectly should you ever need them! The car has just received a new fuel tank at a sum of over £2,000 and has had huge recent expenditure over the past few years. The car come with its original book pack, including its service book, 28 MOT’s on file, and virtually every tax disk since new. It has its original unopened first aid kit, its tool kit and numerous invoices for service and maintenance work. It was last serviced in August this year and now ready for either a life in the country, or around Chelsea. 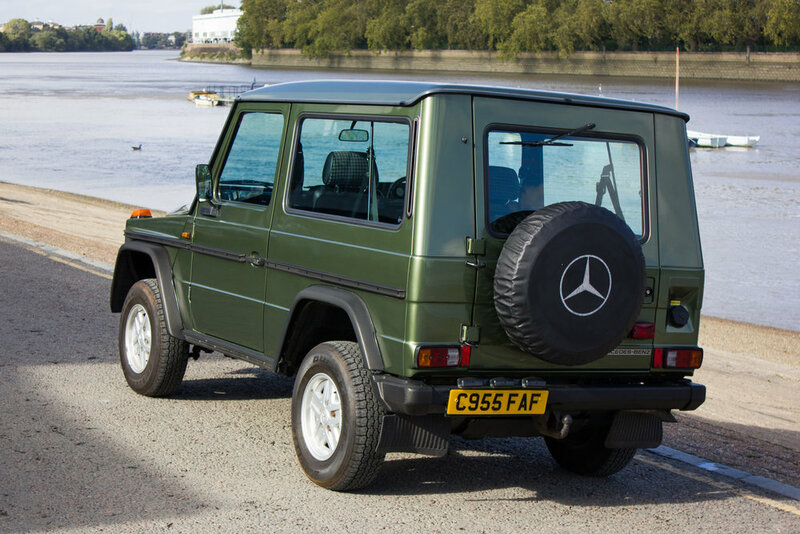 This is great example of an early G-Wagen with wonderful history and all the right options…and it’s green!